Treading on Hollywood in the 1950s for a noir series inspired by the notorious, unsolved Black Dahlia murder case feels like treading on sacred ground for anyone who grew up in Los Angeles, such as myself. I remember how easy it was to fall down a rabbit hole in search of more information i the past; it was fascinating, if grisly, to read about the investigation and just a few of theories about the case, which has inspired a flock of movies, including Brian De Palma's The Black Dahlia (2006). I was initially moved to research the case after I saw True Confessions (1981). Now on basic cable service TNT, and also available to stream for those with a cable TV subscription, I Am the Night does not require any background knowledge about the original case. Ostensibly, it centers around Jay Singletary, a former journalist whose career was broken by his reporting on the case years before. Years later, he is at a particular low point of his life, broken down and scrambling. Then he catches on to a case that could give him redemption. As played by Chris Pine, a good-looking fellow who tries very hard to downplay his outward appearance, we can clearly root for him; he's more of a scoundrel than any sort of antihero. The real star of the show is a teenage girl played by India Eisley, who we meet as a true innocent. She lives in a small town, presumably far away from any kind of serious trouble. Her mother Jimmy Lee (Golden Brooks), on the other hand, appears to be a barely-contained furnace of fury, always ready to lash out at the younger woman. The first episode, directed by Patty Jenkins (reteaming with her Wonder Woman co-star Pine), simmers nicely until its surprising conclusion, which sets the stage for the remainder of the series. The first five (of six) episodes were made available to me for preview, and I found them incredibly easy to binge. There's sufficient mystery to drive the narrative forward, and I enjoyed watching India Eisley develop her character through each episode. A battered Pine provides a good baseline for the drama; Jenkins also directed the second episode, while Victoria Mahoney (the indie Yelling to the Sky and multiple TV shows since) and the dependable Carl Franklin directed others. As a former Los Angeles resident, I always enjoy watching recreations of the city's past history and that may have biased me in the show's favor, but I can't deny my own favorable reactions. 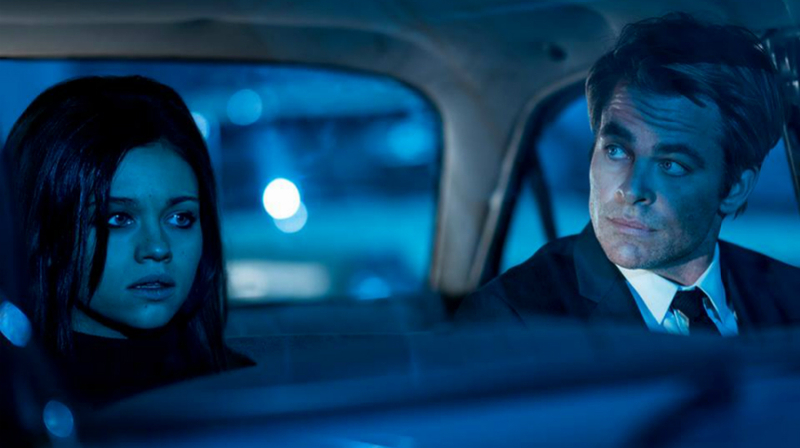 Watch I Am the Night on TNT in the U.S.
Intended as a flagship vehicle to help introduce CBS All Access as a streaming service, Star Trek: Discovery experienced a longer than expected gestation period before debuting successfully in September 2017. Now that a fresh new season has debuted, the question remains: Is it worth subscribing to yet another service just to watch one show? CBS All Access has debuted several other shows in the past year, and, after finally signing up last month and sampling most of them, the only ones that stood out to me were Strange Angel and Star Trek: Discovery. The former series, set in 1930s Los Angeles and following a brilliant factory worker who has a great interest in rockets, hooked me on its first two episodes. Both were directed by David Lowery (The Old Man and the Gun) and photographed by Andrew Droz Palermo, whose credits as a cinematographer extend back to You're Next (he also directed One and Two, which I quite enjoyed). I feel inadequate to review Star Trek: Discovery, in part because I only have a casual acquaintance with the previous series. It's set in the 'primary universe' of the original show, as opposed to the most recent trio of movies, which are set in an 'alternate universe,' and that pretty well exhausts my fund of knowledge. Still, the first season of the new show felt like a shot of adrenaline to revive my interest in science fiction, even though I didn't care for the extreme reliance on the blockbuster-movie style, which basically declares: 'Every. Day. May. Be. Your. LAST!!!' Okay, okay, I get it. Just let me enjoy getting to know the new characters, who could really use more exposure than what the first season offered, beyond the generally fabulous and edgy and sorrowful lead performance by Sonequa Martin-Green. In just two episodes so far, the new season promises a more expansive character storyboard, though I admit I'm flummoxed by the arrival of an Older White Male to be captain of the Enterprise, even if he is Christopher Pike. Reportedly, the original conception of the show held the idea that each season would be different in its premise and execution, so after the captain(s) of the first season, I am willing to be a bit patient. Of course, that is what CBS All Access wants. With 14 episodes intended for Season 2, that's about four months of monthly premiums, which, at this moment, sounds like too much to pay for one show -- maybe two -- that I really enjoy, among the originals. The service also offers CBS's current broadcast shows, none of which jump out at me, as well as a library of past shows, few of which are appealing. Jordan Peele's The Twilight Zone is expected to debut later this year. Watch Star Trek: Discovery on CBS All Access. The Season 2 premiere episode is available via CBS for a limited time for free; see video below. Making its U.S. debut simultaneously on streaming services Shudder and Sundance Now (both owned by AMC Networks) , several months after its U.K. premiere on Sky One, A Discovery of Witches is a lighter entry among the deep-horror, suspense and thriller offerings on Shudder, which is where and how I watched it. The opening two episodes are filled with foreboding gloom. Set in the modern day, the show follows historian/witch Diana Bishop (Teresa Palmer) as she embarks on a course of study with the aim of landing a professorship at Oxford University. In her research, she comes upon a mysterious book that uncovers secrets she never knew existed. Very quickly, she comes into conflict with professor/vampire Matthew Clairmont (Matthew Goode), and discovers her own supernatural talents are surprisingly powerful. In the third episode, the two begin to fall in love, and Diana becomes more of a fluttering historical-romance heroine, and I began to wonder what I was watching. Both Palmer and Goode are appealing actors, so I kept binging, in large measure because of the two leads, as well as appearances by Malin Buska (as a Finnish witch), Owen Teale (as dastardly witch Peter Knox), Alex Kingston and Valarie Pettiford (as the couple who raised Diana after she was orphaned), and Lindsay Dundance (as Matthew's initially icy mother). For Shudder, it's definitely a change of pace, but it fits in with the overall scheme of programming, which has grown past its initial 'horror and hard-edged thrillers' phase to embrace a wider array of genre programming. I watched all eight episodes rather easily over two or three viewing sessions, but am not sure I want to indulge in the forthcoming two seasons, all based on Deborah Harkness' All Souls Trilogy. Help yourself. Watch A Discovery of Witches on Shudder.